Victoria Ford Smith's delightful blog re. children's books written and illustrated by women prompted me to visit my library where I have quite a stack of such books, many of them the favorites I gleaned from my sister's collection when she retired from teaching 1st grade. It's no surprise that I saved Nancy Smiler Levinson's Clara and the Bookwagon. Harper & Row, 1988. Illustrations by Carolyn Croll. This book tells the story of the "country's first traveling bookwagon" which Mary Lemist Titcomb, head of the public library in Hagerstown, MD, designed in 1905. Joshua Thomas, the library janitor, drove Miss Titcomb and hundreds of books through 500 square miles of back country roads. A small bit of history with themes of reading and literacy are to be expected but this little gem also dances about the child as part of the rural labor force. "Books are for rich people... Farm people like us do not have time to read." Another book about books, reading, writing, and libraries that found a spot on my library's shelf was Katie Cleminson's, Otto The Book Bear. New York: Disney Hyperion Books, 2011. When no one is looking Otto leaves his book's pages to go exploring but one day his book is moved and he is left behind--a very small bear all alone in a very big world. "And just when he thought he couldn't walk any farther, when he felt cold and tired, Otto saw a place full of light and hope. He went inside and found...rows and rows of books!" What reader has not known the joy of a library where we find as Otto did "book creatures just like him?" Award-winning Katie Cleminson's other books include: Magic Box; Cuddle Up, Goodnight, Box of Tricks, Wake Up. I love this book! The Midnight Farm is the first children's book published by Reeve Lindbergh in 1987 and illustrated with the heartbreakingly beautiful paintings of Susan Jeffers. The First Puffin Pied Piper Printing (1995) graces my shelves. "Here is the dark when the day is done, Here is the dark with no moon or sun, Here is the dark when the lights are out, Here is the heart of the dark." You can take a look at this book via Amazon. Both Lindbergh and Jeffers have many other books. Jeffers, in particular, is worth exploring. Written for a child who was afraid of the dark, this book makes me feel happy and cozy and safe. 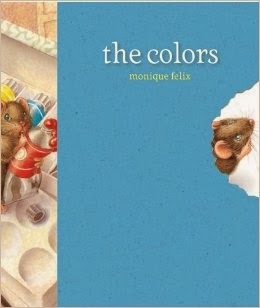 I have the 1993 edition of Monique Felix's The Colors which has been reissued. The delightful Mouse Books are books without words "designed to excite a child's imagination, develop verbal skills, and foster an interest in reading. Each beautifully illustrated book allows a child to create a story while learning an important skill." A sad little mouse gnaws through the page of a book and discovers a box of paints. What a joy! to sit and listen to the story a 4-7 year old tells as they turn page after page of beautiful illustrations. 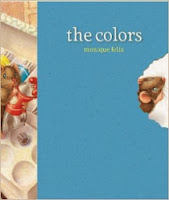 There is an entire series of Mouse Books and Monique Felix has illustrated a number of other books written by others; those have words although not always as much imagination. Mary Batten writes excellent nature books for children and her Baby Wolf is one of the best! 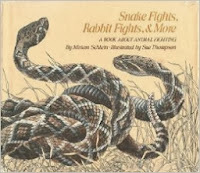 Published by Grosset & Dunlap, New York, 1998, the illustrations by Jo Ellen McAllister Stammen are better than any photos or documentary. It's a lovely true story about family and growing up and being part of a community and surviving and ecology. I love the honesty of the moose hunt where the wolves kill and eat. This is a "science reader" and children who read such books cannot help but love science and care deeply about the environment. Don't miss the chance to take a look at the first few pages with this link to Amazon. Stammen's illustrations are great nature art full of atmosphere and movement. And now for something completely different. Susan Meddaugh's Cinderella's Rat. Boston: Houghton Mifflin, 1997. The prolific Meddaugh offers a retelling of the classic fairy tale from the rat/coachman's point of view. "I was born a rat. I expected to be a rat all my days. But life is full of surprises." This delightful book is also full of surprises. Not enough women writers and illustrators receive awards but When I Was Young in the Mountains by Cynthia Rylant, illustrated by Diane Goode, New York: E. P. Dutton, 1982, is a Caldecott Honor Book. Rylant authored Newbery Medal-winning Missing May, the Newbery Honor Book A Fine White Dust, and two Caldecott Honor-winning picture books: Relatives Came and When I Was Young in the Mountains. "When I was young in the mountains, we went to church in the schoolhouse on Sundays, and sometimes walked with the congregation through the cow pasture to the dark swimming hole, for baptisms. My cousin Peter was laid back into the water, and his white shirt stuck to him, and my Grandmother cried." It is rare to find a book, a children's book, that mentions baptism especially "believer's baptism by immersion" as practiced both by the Baptist Church in which I grew up and by the Church of Christ (Stone-Campbell movement) in which I have spent my adult life. Those pages always warm my heart a bit. Diane Goode's illustration evoke the mist of memory with warmth and whimsy. One of my favorite books. This book is like listening to your grandmother tell stories. If you click the titles you can enjoy the preview at Amazon. It is tragic that this beautiful book by George Ella Lyon with illustrations by Vera Rosenberry is out of print. 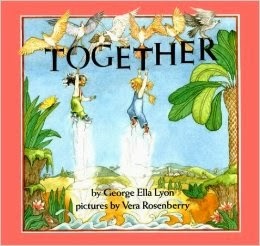 Together was first published in 1989. The paperback 1994 edition (New York: Orchard Paperbacks) is a delight to have on my shelves. Rosenberry's watercolor illustrations bring this poem to life joyfully, exuberantly, radiantly. The book is about two girls--one black, one white--who together share childhood play and imaginative adventure. The girls are a delight as they engage in physical activity of the sort that is all too often limited to the "dangerous" play of boys. It is, of course, a beautiful book about friendship and child agency and imagination but it is so much more. The repeated refrain, "Let's put our heads together and dream the same dream," evokes the speech of Dr. Martin Luther King and offers readers of all ages joyful hope that soars like the girls on the back of birds in the final illustration. "You bring the cheese and I'll fetch the mouse." The author's website is well worth a visit. This book should be back in print!